Wishlist book found at Friends of Hawaii Kai Library book shop. 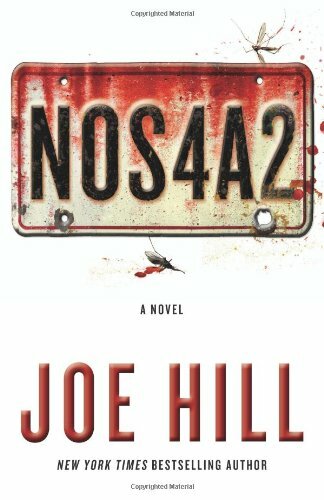 Funny trivia, book is called NOS4R2 in Britain. Giant brick off to Bkind2books as a surprise. Media mail, 05/30/14. This feels like Joe Hill set out to write a Stephen King book. A child from a fragmented family encounters a truly evil being, but suppresses and rationalizes the experience until he/she considers it merely a childhood fantasy once he/she reaches adulthood. And then Pennywise, or whatever, comes back, abducting a loved one, forcing the protagonist to face horrorful reality in order to rescue said love one and restore order. It's so nice to have TWO of them writing the same dang book over and over. And ugh on the kitchen-sink ending - you know, when an author doesn't know how to end the book so he keeps throwing stuff out there, hoping you might like something. I haven't been irritated by this feature more since Ira Levin's Son of Rosemary. I can't believe I spent 700 pages for this lame finish. The story revolves around Vic (short for Victoria). As a girl, she gets a cool bike that has a little extra feature: Vic can use it to find things - her mom's bracelet, a photo, you get the idea. But one day, when she was almost grown, she used the bike to get away from an argument with her mom, and in the process, goes out looking for trouble. She finds it in spades - she encounters Charlie Manx and his Wraith and the Gasmask Man. But Vic is resourceful and escapes. Years later, Vic is all grown up and while there may be a few, shall we say lingering effects, she's put this behind her. But Charlie has not - and if he missed out on Vic, well there's always Vic's son. I won't say more - but it is a thrill ride, a seriously creepy Christmasland type of thrill ride. Joe Hill takes us on a ride through the landscape of childhood and deposits us on the other side, sadder and wiser. He inserts sly little references - nods to pop culture and Shawshank and other family bits. I liked Heart-Shaped Box but he streaked to a whole new level with NOS4A2. We are sharing this dream together. It is your dream, Bing. But it is still my ride. Was there any human urge more pitiful - or more intense - than wanting another chance at something? The difference between childhood and adulthood...was the difference between imagination and resignation. You traded one for the other and lost your way. It seemed to her sometimes that this was the only fight that mattered: the struggle to take the world's chaos and make it mean something, to put it to words. Whatever the children had become, whatever he had done to them, he had done to make them safe, to keep them from being run down by the world. He believed in his own decency with all his heart. So it was with every true monster. Sending in the wishlist tag game as a tag forward to Firegirl. Firegirl, there is no obligation to play but hope you'll take a look - we're always looking for more tag players. Releasing as a tag forward in the wishlist tag game. Enjoy! This brick of a book arrived safely today. Thanks!! I appreciate the RABCK and have been watching the Wishlist Tag Game in hopes of participating soon. I listened to this on audiobook else I don’t think I’d ever have gotten through it. (That seems to be how it is with me and Hill’s work these days. I felt the same about The Fireman). Much like his father, Hill needs some editing help; his books are just way longer than needed. This was a decent enough story, though there was nothing super new or original, really. Horror with a bit of the fantastical. Not bad, if that’s your thing. I think my biggest issue with Hill is that I loved his first book Heart-Shaped Box so very much and I want all his other work to be as good, but it just isn't. I will say that I find his books more enjoyable than his father's work, for the most part. Passed on at today's BCinDC gathering. I think it may be on its way to the Day of the Book! Vic McQueen finds things: she rides her bike across the long-gone Shorter Way Bridge, and on the other side is whatever she's looking for, no matter where. One day she goes looking for trouble and finds Charlie Manx, serial killer and child abductor. The story spans several decades, following Vic's life from childhood through motherhood. There were parts that reminded me of Dean Koontz or Stephen King at their very best. Manx and his assistant Bing never fail to be terrifying, and since it's Hill you're not guaranteed anyone will survive. The gore was effective but but gratuitous. I liked a lot of the characters, especially Lou Carmody (perhaps because I know guys like that in real life). The only part I didn't really like was the ending. I understand why things turned out the way they did, but I'd still hoped for something different. That said, I recommend any of Hill's books to lovers of paranormal thrillers and horror. This was fantastic.